MMM for breakfeast!!!!!! Put an egg on it! 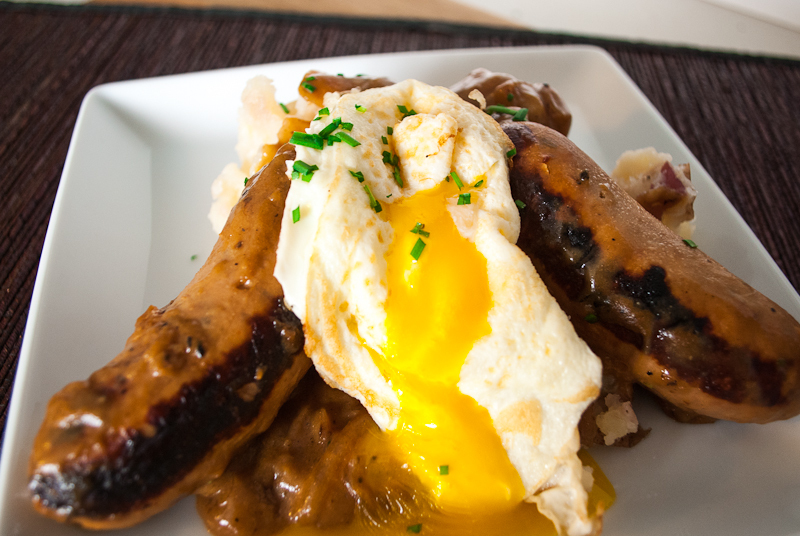 Well for me Bangers and Mash is some serious comfort food. For me this is great comfort food, yep meat and potatoes. 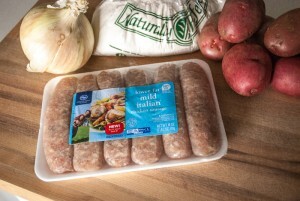 This is a standard for English or Irish pub grub, that can be made with generally any kind of sausage or bratwurst but typically with a mild flavored pork sausage. Funny enough this product of World War I got its name from its ability to explode with a loud bang during cooking. 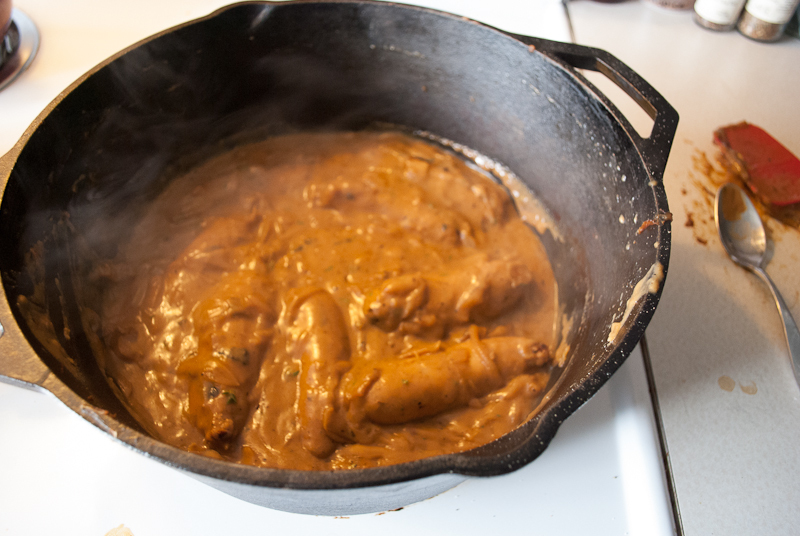 This cheaply made, but hardy meal served a greater part of the working class for lunch and dinner, mostly due to the fact that the Bangers were a ration from the war. I made these Bangers and Mash with a mild Italian chicken sausage mostly because most everything I eat these days goes directly to my waste line. 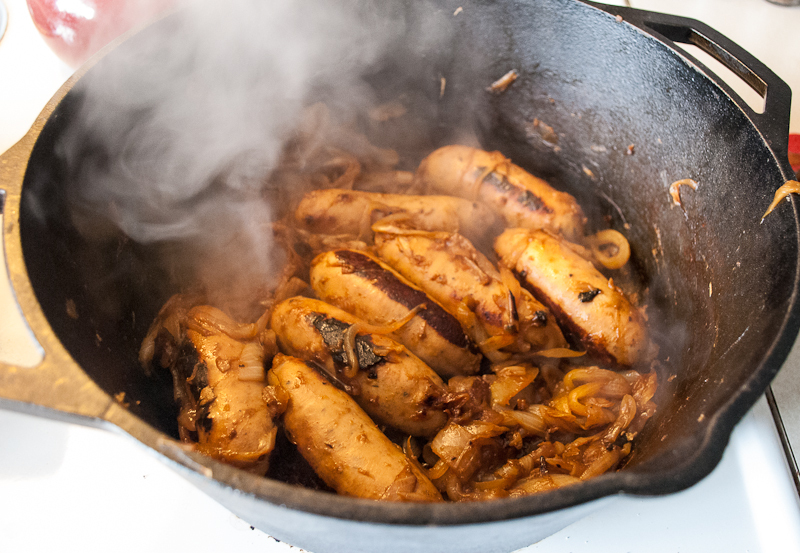 This is a simple dish made with herbs, sausage, onions, potatoes and sometimes wine, just different strokes for different folks. 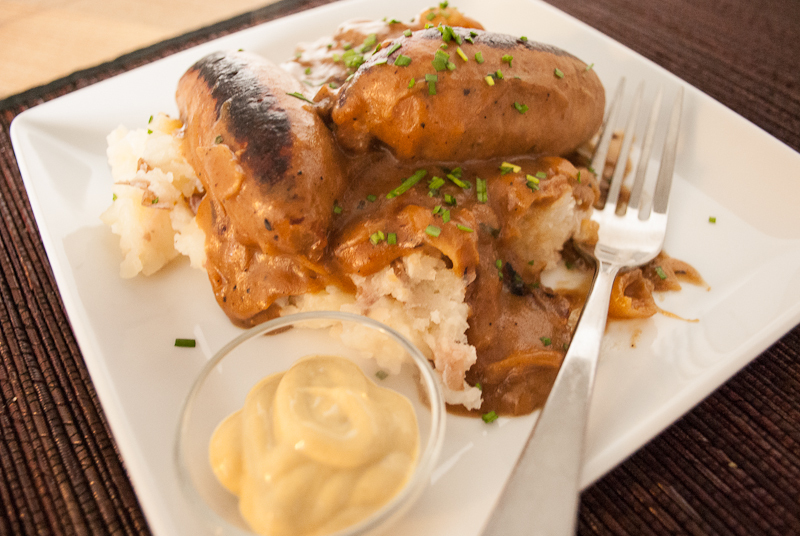 I would consider this a not the traditional way and not its normal preparation, but I feel the way I make it this way is mighty tasty and compared well to the Scottish pub down the street, but this is my take and it may be a little different than the real thing, but its really tasty!!! I can eat this no matter what time of the day breakfast, lunch or dinner, put an egg on it. 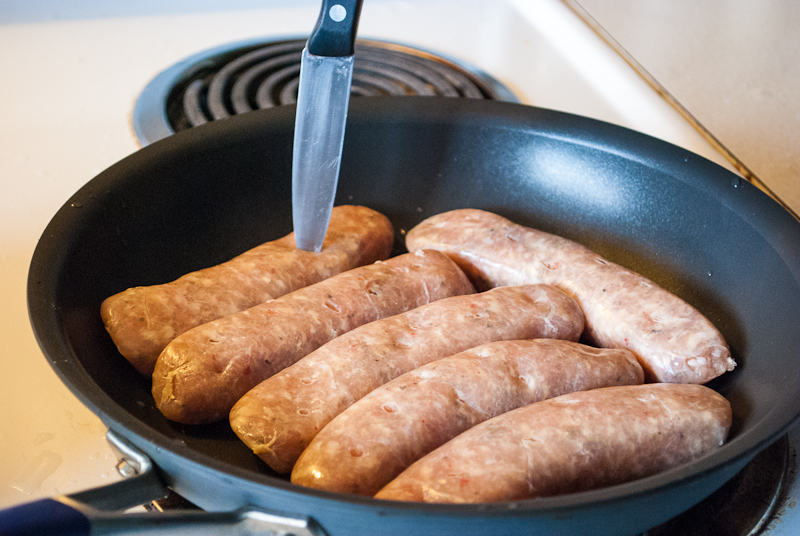 Stab or pierce the sausages and sear on all sides. Add onions, cook until caramelize. Cook down and add the roux. Yep Mash the potatoes I think this is partly why they call it Bangers and ….. In a deep skillet or dutch oven sear sausages on all sides. Prick sausages with a knife or fork, add butter and sliced onions. Stir occasionally every 3-5 minutes and reduce heat slowly to keep contents from burning. 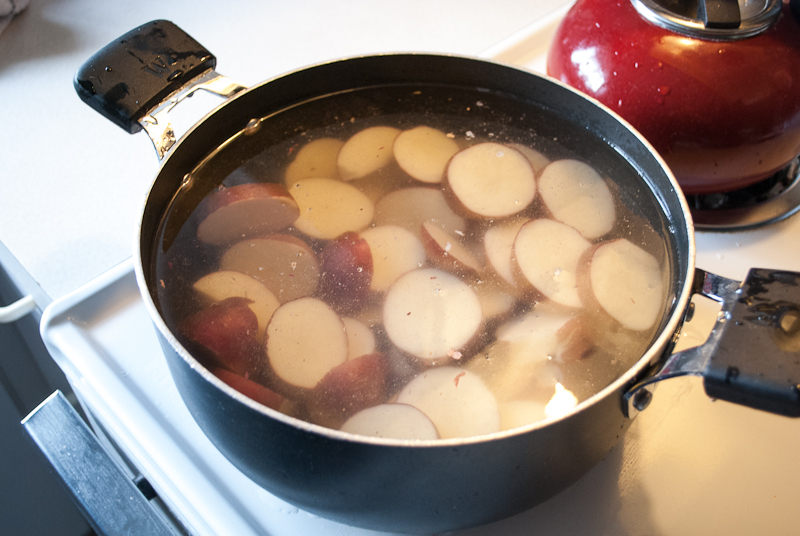 Clean and slice potatoes to 1/2″ add to separate pot cover with water salt to taste and boil until soft and tender. 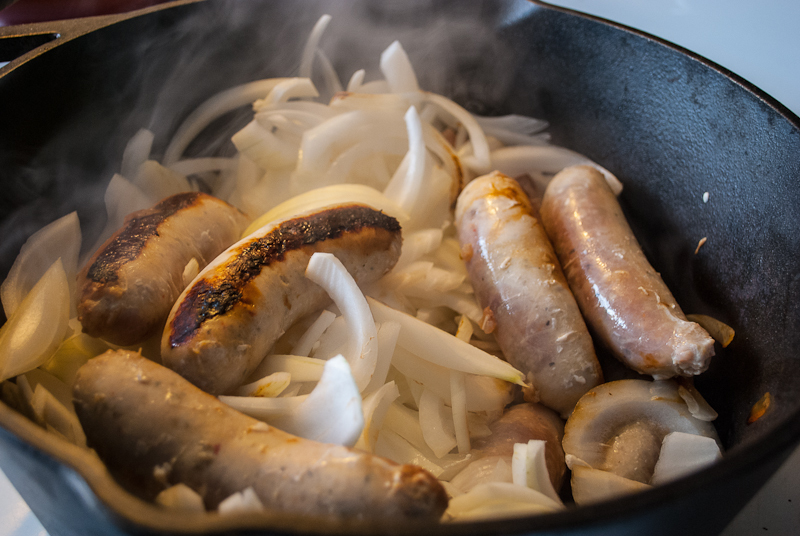 When onions have cooked down and caramelized to a dark brown whisk 2 cups of milk with brown rice flour and combine, bring to boil and reduce heat to simmer and add minced thyme leaves. 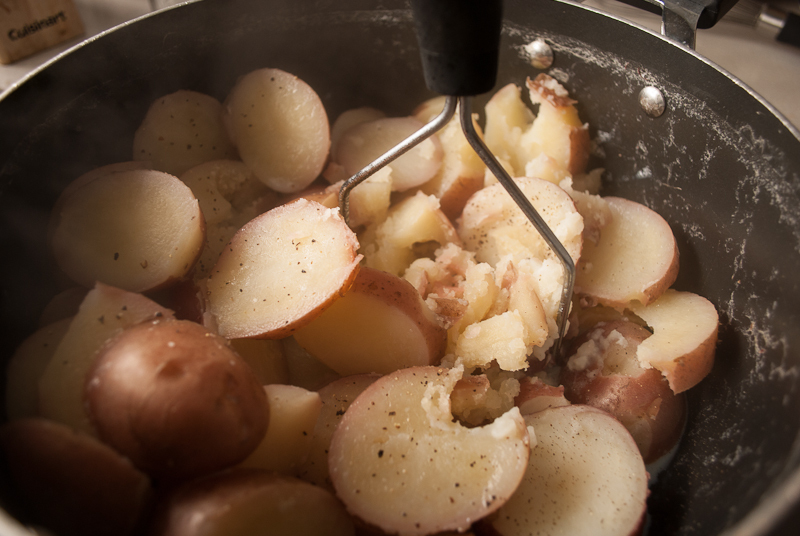 When potatoes are tender and soft, drain water add 1 cup milk and salt and pepper to taste and mash. To plate, scoop some mash and place 1-2 bangers and onion gravy over the top enjoy! !